Napoléon "Nap" Lajoie (/ˈlæʒəweɪ/; September 5, 1874 – February 7, 1959), also known as Larry Lajoie and nicknamed "The Frenchman", was an American professional baseball second baseman and player-manager. He played in Major League Baseball (MLB) for the Philadelphia Phillies, Philadelphia Athletics (twice), and Cleveland Naps between 1896 and 1916. He managed the Naps from 1905 through 1909. Lajoie was signed to the National Leagues's (NL) Phillies in 1896. By the beginning of the twentieth century, however, the upstart American League (AL) was looking to rival the supremacy of the NL and in 1901, Lajoie and dozens of former National League players joined the American League. National League clubs contested the legality of contracts signed by players who jumped to the other league but eventually, Lajoie was allowed to play for Connie Mack's Athletics. During the season, Lajoie set the all-time American League single-season mark for the highest batting average (.426). :p.76:p.88 One year later, Lajoie went to the Cleveland Bronchos where he would play until the 1915 season when he returned to play for Mack and the Athletics. While with Cleveland, Lajoie's popularity led to locals electing to change the club's team name from Bronchos to Napoleons ("Naps" for short), which remained until after Lajoie departed Cleveland and the name was changed to Indians (the team's present-day name). Lajoie led the AL in batting average five times in his career and four times recorded the highest number of hits. During several of those years with the Naps he and Ty Cobb dominated AL hitting categories and traded batting titles with each other, most notably coming in 1910, when the league's batting champion was not decided until well after the last game of the season and after an investigation by American League President Ban Johnson. Lajoie in 1914 joined Cap Anson and Honus Wagner as the only major league players to record 3,000 career hits. He led the NL or AL in putouts five times in his career and assists three times. He has been called "the best second baseman in the history of baseball" and "the most outstanding player to wear a Cleveland uniform. ":p.207 Cy Young said, "Lajoie was one of the most rugged players I ever faced. He'd take your leg off with a line drive, turn the third baseman around like a swinging door and powder the hand of the left fielder. ":p.86 He was elected to the National Baseball Hall of Fame in 1937. Lajoie was born in Woonsocket, Rhode Island, to Jean Baptiste and Celina Guertin Lajoie. The elder Lajoie was French-Canadian and had emigrated to the United States. Upon arrival to the U.S. he first settled in Rutland, Vermont, but then moved to Woonsocket, where Lajoie, the youngest of eight surviving children, was born. Throughout his childhood Lajoie received little formal education. Against the Washington Senators on August 12, 1896, Lajoie made his major league debut. He played first base and recorded a single. :p.19 Ed Delahanty was being considered to play the first base position after Dan Brouthers retired. Delahanty, however, wanted Lajoie to play first so he could return to his natural position of left field. Delahanty said to Lajoie, "Look, sonny, you tell the boss you’re a first baseman and you and me are gonna get along." Lajoie became the team's first baseman and by the end of the season, he and Delahanty were roommates. Later in 1898, new manager George Stallings moved Lajoie to second base, commenting that "[Lajoie would] have made good no matter where I positioned him." Lajoie hit .363 and led the NL in slugging percentage in 1897 and doubles and RBIs in 1898.:p.20 He had a .378 batting average in 1899, though he played only 77 games due to an injury. In 1900, he missed five weeks due to a broken thumb suffered in a fistfight with teammate Elmer Flick. In 1901, the newly created American League had attracted several of the top players in the competing National League to join its ranks. Rogers declined Lajoie's request for an increase in salary and as a result, Lajoie jumped to the crosstown Philadelphia Athletics, owned by former Phillies' part-owner Benjamin Shibe and managed by Connie Mack. Frank Hough offered Lajoie the contract on behalf of Mack. "Hough offered me $24,000 ($683,808 in current dollar terms) for four years. You can bet I signed in a hurry", Lajoie said. :p.97 Lajoie was considered "the first superstar" to join the newly formed AL. He was also the first player whose yearly salary was for $4,000 ($113,968 in current dollar terms). :p.88:p.180:p.42 "The Phillies opened their season and drew 6,000 fans. A week later, when we opened, there were 16,000 in the stands. The American League was here to stay", Lajoie later said. Lajoie's batting average that year was .426 (it was originally recorded at .405, later changed to .422 before finally revised again to .426). :p.76:p.88 The batting average mark became the all-time AL record after the number was revised. Previously, Ty Cobb and George Sisler had been credited with having the AL's all-time mark. That same year in a game against the Chicago White Sox' Clark Griffith, Lajoie became the second Major Leaguer to be intentionally walked with the bases loaded in an 11–7 game after Abner Dalrymple in 1881.:p.179 For the 1901 season, Lajoie led the majors in doubles (48), and led the majors in hits (232), batting average (.426), runs (145), on-base (.463) and slugging percentage (.643), and total bases (350). His 125 RBIs led the AL and his 14 home runs were a career-best and his 48 doubles are a Philadelphia Athletics' record. :p.341 Mack said of Lajoie, "He plays so naturally and so easily it looks like lack of effort." Author Robert Kelly writes: "The .422 batting average of Lajoie still stands as an AL record. To some degree, however, it is tainted. The 1901 season was the first for the AL and the level of competition was presumably evolving. Such questions, however, in no way cast doubt on the extraordinary batting ability of the second baseman." In April 1902, the Supreme Court of Pennsylvania overruled an earlier decision by the Court of Common Pleas and upheld the reserve clause in contracts between players and NL clubs. President of the Chicago National League Club Jim Hart said the state Supreme Court's decision had dealt "a fatal blow to the rival league" and NL clubs "have won a great victory." The Phillies' Rogers obtained an injunction barring Lajoie from playing baseball for any team other than his team. However, a lawyer discovered the injunction was only enforceable in the state of Pennsylvania. The courts ruled the reserve clause was not valid for players who signed with an AL team. Mack responded by trading Lajoie and Bill Bernhard to the then-moribund Cleveland Bronchos, whose owner, Charles Somers, had provided considerable financial assistance to the A's in the early years. :p.36 Lajoie was also pursued by Charles Comiskey, owner of the Chicago White Sox. Lajoie, nicknamed "The Frenchman" and considered baseball's most famous player at the time, arrived in Cleveland on June 4 and his play was immediately met with approval from fans. :p.41:p.55:p.17 The Bronchos drew 10,000 fans to League Park in Lajoie's first game. :p.12 The Bronchos' record at the time Lajoie and fellow Athletics teammate, Bill Bernhard, joined was 11–24 and improved to 12–24 after the team's inaugural game with their new players, a 4–3 win over the Boston Americans. :p.13 The team went on to finish 69–67, fifth in the AL, for the franchise's first winning record since the AL began as a league. After his first season with the Bronchos, Lajoie's .378 average led all AL players. New York Giants manager, John McGraw, was rumored to want to sign Lajoie but Lajoie stated his intentions when he said "...for I intend to stick to Cleveland." For the remainder of 1902 and most of 1903, Lajoie and Flick traveled separately from the rest of the team, needing to avoid entering Pennsylvania so as to avoid a subpoena (the only team they could legally play with inside state limits was the Phillies). When the Naps went to play in Philadelphia, Lajoie and Bernhard would go to nearby Atlantic City to help pass the time. :p.36 The issue was finally resolved when the leagues made peace through the National Agreement in September 1903 (which also brought the formation of the World Series). :p.13:p.40 To begin the 1903 season, the club changed its name from the Bronchos to the Naps in honor of Lajoie after a readers' poll result was released by the Cleveland Press. :p.13 (The team was officially the Blues in their inaugural AL season but changed to the Bronchos for the 1902 season.) The Bronchos finished the season 77–63 and Lajoie finished his first full season with the club again the AL's batting champion with a .344 average. He also led the league in slugging percentage (.518), finished second in doubles (41), third in RBIs (93) and tied for fifth in home runs (7). In the off-season he contracted pleurisy. In June of the 1907 season, Lajoie's .296 average, "an average even now that scores of players would be glad to accept," put him at risk for hitting below .300 for the first time in his career. He also missed 15 games due to a recurrence of sepsis which he contracted during the 1905 season. :p.15 Lajoie and Naps first baseman George Stovall got into an argument in a hotel lobby and Stovall broke a chair over Lajoie's head. "George didn't mean anything by it", Lajoie said, and the two maintained a working relationship. :p.57:p.98 He finished the season with an average of .299. Naps owner Charles Somers received a trade offer from the Detroit Tigers for the Naps' Elmer Flick and Tigers' Ty Cobb. Tigers manager Hughie Jennings called Somers and told him he was offering the trade because Cobb was not getting along with several teammates. Somers decided to retain Flick, saying, "We'll keep Flick. Maybe he isn't as good a batter as Cobb, but he's much nicer to have on the team. ":p.16 The Naps finished the regular season in second place to the Tigers with a 90–64 record, a half-game behind the Tigers (who finished 90–63 and were not forced to make-up a rained out game in accordance with league rules). :p.16 Lajoie was partly blamed for the Naps' second-place finish. Author Fred McMane described an instance during the season between Naps catcher Nig Clarke and Lajoie. Lajoie's dissatisfaction with the Naps' play worsened. "You can't win in the major leagues unless you have players who know the game. We don't have time to teach and train youngsters up here. Our job is to win pennants, not run schools", he said. :p.65 Franklin Lewis, sports writer and author, wrote "Lajoie, in spite of his marvelous fielding and tremendous batting, was not exactly a darling of the grandstand as a manager. ":p.52 Lajoie recommended to Somers on August 17, 1909, he find the team a new manager, although he wanted to remain on the club as a player. Somers responded to Lajoie by giving him more time to finalize his decision but when Lajoie came back days later and announced the same decision, Somers acted quickly to find a replacement. 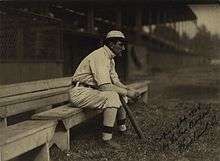 Lajoie later described the decision to take on the added duties as a player-manager as the biggest mistake of his career as he felt it negatively affected his play. The highest-paid player in the league, he also offered a $10,000 ($263,815 in current dollar terms) reduction in salary. Somers promoted Naps coach Deacon "Jim" McGuire to manager. :p.17 The team finished 71–82 while Lajoie's .324 average was third in the AL and 33 doubles second. The Naps finished 1910 71–81 but Lajoie had one of his better seasons statistically as he led the majors with a .384 average[a] and 227 hits, both categories bettered only in Lajoie's 1901 campaign. His 51 doubles, a career-high, and 304 total bases led the majors, the fourth and final time in his career he would lead the majors in the latter category. Lajoie missed significant parts of back-to-back seasons, the first in 1911 when he appeared in just 90 games. Stovall, the former Naps first baseman, replaced McGuire as the club's manager and the Naps finished 80–73. :p.19 Lajoie was forced to sit out six weeks of the 1912 season when he sprained his back in May during a practice session in Chicago. He played in 117 games on the season, an increase of the 90 he played in one season before, but Cleveland, who had hired Joe Birmingham as the team's fifth manager since Lajoie gave up the role in 1909, finished 75–78. :p.19 Lajoie and Joe Jackson tied for the team lead with 90 RBIs. :p.20 He finished fourth in the AL with a .368 batting average. In 1913, Birmingham and Lajoie had arguments in the open, including one incident in June when Lajoie cursed Birmingham openly to reporters after being benched during a batting slump. :p.20 Lajoie hit .335 on the year, the last time he would hit over .300 in his career. Several years after his retirement, a story in The Milwaukee Sentinel talked of Lajoie's ability to "outguess any pitcher." Lajoie faced pitcher Red Donahue, who avoided pitching fastballs to Lajoie after seeing him go 4-for-4 against a fellow pitching mate. Donahue instead made pitches on the outside corner, to which Lajoie reached over "and hit them with ease." Donahue then proceeded to aim a pitch at Lajoie's head and he proceeded to hit a home run. "That's the kind I eat", he said. The Lajoie-Cobb rivalry reached a peak in 1910, when Hugh Chalmers of the Chalmers Auto Company (a direct predecessor to modern-day Chrysler) promised a Chalmers 30 Roadster to the season's batting champion. The public became fascinated with the daily statistics of Lajoie and Cobb in what became known as the Chalmers Race. Sports bettors, who by this time followed the sport attentively, also followed the daily reports with interest. Cobb took the final two games, a doubleheader, off against the Chicago White Sox, confident that his average was safe and would allow him to win the AL batting title—unless Lajoie had a near-perfect final day. Going into the final game of the season, Cobb's average led Lajoie's, .383 to .376. Lajoie and the Naps faced a doubleheader against the St. Louis Browns in Sportsman's Park, Cleveland's final two games of the season. After a sun-hindered fly ball went for a stand-up triple and another batted ball landed for a cleanly hit single, Lajoie had five subsequent hits – bunt singles dropped in front of rookie third baseman Red Corriden (whose normal position was shortstop), who was playing closer to shallow left field on orders, it has been suggested, of manager Jack O'Connor. In his second at bat of the second game, Lajoie reached base on another bunt but the runner on first base advanced. According to the rules of that time, the hit was scored a sacrifice and thus, Lajoie did not record an official at bat. He finished the doubleheader a perfect 8-for-8 and his batting average increased to .384, .001 greater than Cobb's mark. Although the AL office had not officially announced the results, Lajoie began to receive congratulations from fans and players, including eight of Cobb's Detroit Tigers teammates. Most players in the league preferred Lajoie's personality to that of Cobb's. :p.124 Coach Harry Howell is reported to have said to the game's official scorer, E. V. Parish, "to do well by Lajoie." Howell was reported to have offered a bribe to Parish, which described in Al Stump's biography of Cobb, was a $40 ($982 in current dollar terms) suit. Parish refused the offer and the resulting uproar ended in O'Connor and Howell being banned from the major leagues by AL President Ban Johnson. "To date, it seems that no one knows for certain who won that 1910 batting title. Total Baseball, which is now the official major-league record, lists both men at .384 in its seasonal section, but its player register has Lajoie at the same number and Cobb at .383—so even the various editors of that source do not, or cannot, agree." Jon Wertheim wrote in Sports Illustrated 100 years after the event, "The statistics for the Detroit players had been crossed out and nullified. Every Detroit player, that is, except one: Ty Cobb. It takes something less than a detective to arrive at the conclusion that at some point Johnson (or someone in the league office, anyway) realized the error and decided to conceal it." During spring training before the 1928 season, Lajoie commented on the 1927 New York Yankees. "Of course, you could see a lot of loafing going on but if that club is the greatest of all times, you just know that we had a lot of clubs in my time who were world champions and didn't know it." He died in Daytona Beach, Florida in 1959, at the age of 84 from complications associated with pneumonia. He had fallen in the autumn of 1958 and fractured his arm. His wife had died earlier in 1951. In 1999, he ranked number 29 on The Sporting News' list of the "100 Greatest Baseball Players", and was a nominee for the Major League Baseball All-Century Team. a Major League Baseball has not revised Cobb's batting average, which would then designate Lajoie as the 1910 batting champion. The Sporting News wrote of statistical evidence showing Cobb's 1910 season statistics had been tampered with and he was given two extra base hits but MLB Commissioner Bowie Kuhn declined to announce Lajoie the winner. Both the Society for American Baseball Research and Baseball-Reference.com list Lajoie as having the higher batting average and thus, the batting champion. 1 2 3 4 5 6 7 8 9 10 11 12 13 14 15 16 "Nap Lajoie Statistics and History". Baseball-Reference.com. Retrieved September 24, 2012. 1 2 3 "Nap Lajoie Breaks Arm In Fall". Daytona Beach Morning Journal. February 21, 1958. p. 9. Retrieved September 12, 2012. 1 2 3 Cressman, Mark (2008). The A-to-Z History of Base Ball. Bloomington, Indiana: Xlibris Corporation. ISBN 978-1-4363-2260-7. Retrieved September 20, 2012. 1 2 3 4 5 6 Rains, Rob (2004). Rawlings Presents Big Stix: The Greatest Hitters in the History of the Major Leagues. Champaign, Illinois: Sports Publishing. ISBN 1-58261-757-0. Retrieved September 24, 2012. ↑ Corcoran, Cliff (July 22, 2011). "Where does Alomar rank among game's best second basemen?". Si.com. ↑ Gietshchier, Steven P. (2000). Kirsch, George B.; Harris, Othello; Nolte, Claire E., eds. Encyclopedia of Ethnicity and Sports in the United States. Westport, Connecticut: Greenwood Press. p. 280. ISBN 0-313-29911-0. Retrieved September 20, 2012. 1 2 3 4 5 6 7 8 Fingers, Rollie; Ritter, Yellowstone (2010). The Rollie Fingers Baseball Bible: Lists and Lore, Stories and Stats. Covington, Kentucky: Clerisy Press. ISBN 978-1-57860-342-8. Retrieved September 20, 2012. 1 2 3 4 5 6 7 8 "Napoleon Lajoie, Indians great". The Plain Dealer. Cleveland, Ohio: Advance Media. February 7, 2011. Retrieved September 12, 2012. 1 2 3 Kalb, Elliot (2005). Who's Better, Who's Best in Baseball?. New York: Mc-Graw Hill. ISBN 0-07-144538-2. Retrieved September 20, 2012. 1 2 3 4 5 Jordan, David M. (2002). Occasional Glory: The History of the Philadelphia Phillies. Jefferson, North Carolina: McFarland & Company. ISBN 0-7864-1260-7. Retrieved September 18, 2012. ↑ "1896 Fall River Indians Statistics". Baseball-Reference.com. Retrieved September 11, 2012. 1 2 3 "Nap Lajoie Out to Make Baseball History; Frenchman One of the Most Popular Players in Game". The Milwaukee Sentinel. January 31, 1915. Retrieved September 12, 2012. 1 2 3 Fleitz, David L. (2001). Shoeless: The Life and Times of Joe Jackson. Jefferson, North Carolina: McFarland & Company. ISBN 978-0-7864-3312-4. Retrieved September 20, 2012. ↑ "1897 National League Batting Leaders". Baseball-Reference.com. Retrieved September 18, 2012. ↑ "1898 National League Batting Leaders". Baseball-Reference.com. Retrieved September 18, 2012. ↑ Maroon, Thomas; Maroon, Margaret; Holbert, Craig (2007). Akron-Canton Baseball Heritage. Charleston, South Carolina: Arcadia Publishing. p. 17. Retrieved September 16, 2012. ↑ Adler, Richard (2008). Mack, McGraw, and the 1913 Baseball Season. Jefferson, North Carolina: McFarland & Company. p. 11. ISBN 978-0-7864-3675-0. Retrieved September 20, 2012. 1 2 Jordan, David M. (1999). The Athletics of Philadelphia: Connie Mack's White Elephants, 1901–1954. Jefferson, North Carolina: McFarland & Company. ISBN 0-7864-0620-8. Retrieved September 24, 2012. 1 2 3 4 5 6 7 8 McMane, Fred (2000). The 3,000-Hit Club. Champaign, Illinois: Sports Publishing. ISBN 9781582612201. Retrieved September 24, 2012. 1 2 3 4 Anderson, David W. (2000). More than Merkle: A History of the Best and Most Exciting Season in Human History. Lincoln, Nebraska: University of Nebraska Press. ISBN 0-8032-1056-6. Retrieved September 20, 2012. ↑ "Nap Lajoie Was the Leader". Saskatoon Star-Phoenix. November 18, 1961. p. 20. Retrieved September 20, 2012. 1 2 Taylor, Ted (2010). The Ultimate Philadelphia Athletics Record Book 1901–1954. Bloomington, Indiana: Xlibris. ISBN 978-1-4500-2572-0. Retrieved September 20, 2012. ↑ Kelly, Robert E. (2009). Baseball's Offensive Greats of the Deadball Era: Best Producers Rated by Position, 1901–1919. Jefferson, North Carolina: McFarland & Company. p. 74. ISBN 978-0-7864-4125-9. Retrieved September 18, 2012. ↑ "Blow To American League". The New York Times. April 22, 1902. Retrieved September 14, 2012. ↑ "Baseball Players Enjoined". The New York Times. April 24, 1902. Retrieved September 14, 2012. ↑ "American League Celebrates 75th Year". Daytona Beach Morning Journal. Associated Press. January 30, 1975. p. 3C. Retrieved September 14, 2012. ↑ "1902 Cleveland Bronchos Batting, Pitching & Fielding Statistics". Baseball-Reference.com. Retrieved September 14, 2012. ↑ "Pneumonia Relapse Fatal to Original Hall-of-Famer". The Gadsden Times. Associated Press. February 8, 1959. p. 12. Retrieved September 14, 2012. 1 2 3 4 5 6 Cook, William A. (2008). August "Garry" Herrmann: A Baseball Biography. Jefferson, North Carolina: McFarland & Company. ISBN 978-0-7864-3073-4. Retrieved September 20, 2012. ↑ "Other Outlaw Clubs Wanted Nap Lajoie". The Pittsburg Press. May 27, 1902. p. 16. Retrieved September 14, 2012. ↑ "1902 Cleveland Bronchos Schedule, Box Scores and Splits". Baseball-Reference.com. Retrieved September 15, 2012. ↑ "1902 American League Season Summary". Baseball-Reference.com. Retrieved September 15, 2012. 1 2 3 4 "Cleveland Indians Team History & Encyclopedia". Baseball-Reference.com. Retrieved September 15, 2012. ↑ "1902 American League Batting Leaders". Baseball-Reference.com. Retrieved September 15, 2012. ↑ "Nap Lajoie Declares He Will Stay With Cleveland". The Pittsburg Press. August 17, 1902. p. 19. Retrieved September 12, 2012. ↑ "1903 American League Batting Leaders". Baseball-Reference.com. Retrieved September 15, 2012. 1 2 3 4 Lewis, Franklin A. (2006). The Cleveland Indians. Kent, Ohio: The Kent State University Press. ISBN 0-87338-885-2. Retrieved September 24, 2012. 1 2 Humphreys, Michael A. (2011). Wizardry: Baseball's All-Time Greatest Fielders Revealed. New York: Oxford University Press. ISBN 978-0-19-539776-5. Retrieved October 14, 2012. 1 2 James, Bill (2003). The New Bill James Historical Baseball Abstract. New York: Free Press. ISBN 0-684-80697-5. Retrieved October 14, 2012. ↑ "1906 American League Season Summary". Baseball-Reference.com. Retrieved September 16, 2012. ↑ "1906 American League Batting Leaders". Baseball-Reference.com. Retrieved September 16, 2012. ↑ "Nap Lajoie Is Falling Down". The Pittsburg Press. June 29, 1907. p. 3. Retrieved September 12, 2012. ↑ "1908 American League Batting Leaders". Baseball-Reference.com. Retrieved September 16, 2012. ↑ "1909 American League Batting Leaders". Baseball-Reference.com. Retrieved September 16, 2012. ↑ "1910 American League Season Summary". Baseball-Reference.com. Retrieved September 16, 2012. 1 2 "1910 American League Batting Leaders". Baseball-Reference.com. Retrieved September 16, 2012. ↑ "Stars Absent From Game". The Troy Northern Budget. October 1, 1911. p. 13. Retrieved September 17, 2012. ↑ "Nap Lajoie Will Be Out For Six Weeks". The Pittsburg Press. May 6, 1912. p. 16. Retrieved September 12, 2012. ↑ "1912 American League Batting Leaders". Baseball-Reference.com. Retrieved September 18, 2012. ↑ Goodman, Rebecca; Brunsman, Barrett J. (2005). This Day in Ohio History. Cincinnati: Emmis Books. p. 293. ISBN 1-57860-191-6. Retrieved September 20, 2012. ↑ "Cleveland Indians Team History & Encyclopedia". Baseball-Reference.com. Retrieved September 24, 2012. ↑ "1915 Philadelphia Athletics Batting, Pitching & Fielding Statistics". Baseball-Reference.com. Retrieved September 24, 2012. ↑ "1916 Philadelphia Athletics Batting, Pitching & Fielding Statistics". Baseball-Reference.com. Retrieved September 24, 2012. ↑ "Oakland Athletics Team History & Encyclopedia". Baseball-Reference.com. Retrieved September 24, 2012. 1 2 Barzilla, Scott (2002). Checks and Imbalances: Competitive Disparity in Major League Baseball. Jefferson, North Carolina: McFarland & Company. ISBN 0-7864-1255-0. Retrieved September 24, 2012. ↑ "Nap Lajoie Will Wield Bat Under Banner of Colonel Ebbets This Year". The New York Times. March 23, 1918. Retrieved September 11, 2012. ↑ "Nap Lajoie Is Declared Free". The Vindicator. Youngstown, Ohio. April 14, 1918. p. 1C. Retrieved September 14, 2012. ↑ "Nap Lajoie Quits Game". The New York Times. December 28, 1918. Retrieved September 11, 2012. 1 2 "Nap Lajoie Could Outguess Hurlers". The Milwaukee Sentinel. July 8, 1923. Retrieved September 12, 2012. 1 2 3 4 5 Wertheim, L. Jon (September 20, 2010). "The Amazing Race". Sports Illustrated. Retrieved September 12, 2012. 1 2 Manoloff, Dennis (October 8, 2010). "A century doesn't erase questions surrounding Nap Lajoie's 8-for-8 day". Plain Dealer. Cleveland, Ohio. Retrieved September 14, 2012. ↑ Schwarz, Alan (July 31, 2005). "Numbers Are Cast in Bronze, but Are Not Set in Stone". The New York Times. Retrieved September 16, 2012. ↑ Melody, Tom (April 9, 1986). "A Century Of Figures And Facts The Sporting News Is Still Going Strong". Orlando Sentinel. KNT News Service. Retrieved September 16, 2012. ↑ Vail, James F. (2001). The Road to Cooperstown: A Critical History of Baseball Hall of Fame Selection Process. Jefferson, North Carolina: McFarland & Company. p. 210. ISBN 0-7864-1012-4. Retrieved September 20, 2012. ↑ "Ty Cobb Statistics and History". Baseball-Reference.com. Retrieved September 24, 2012. ↑ "Nap Lajoie – Induction Speech". Baseballhall.org. National Baseball Hall of Fame and Museum. Retrieved September 16, 2012. ↑ "Three Baseball Greats Selected". Telegraph-Herald. Dubuque, Iowa. January 20, 1937. p. 9. Retrieved September 14, 2012. ↑ "1939 Induction Ceremony". Baseballhall.org. National Baseball Hall of Fame and Museum. Retrieved September 16, 2012. ↑ McNeil, William F. (2009). All-Stars for All Time: A Sabremetric Ranking of the Major League Best, 1876–2007. Jefferson, North Carolina: McFarland & Company. p. 145. ISBN 978-0-7864-3500-5. Retrieved October 14, 2012. ↑ "Yanks Failed To Show Much to Nap Lajoie". The Miami News. April 15, 1928. p. 15. Retrieved September 12, 2012. ↑ "Nap Lajoie Victim of Pneumonia". The Miami News. Associated Press. February 8, 1959. p. 5-C. Retrieved September 11, 2012. ↑ "Nap Lajoie Laid to Rest". The Miami News. United Press International. February 9, 1959. p. 1C. Retrieved September 12, 2012. ↑ "Baseball's 100 Greatest Players". Baseball-almanac.com. Retrieved September 11, 2012. ↑ "Line-Up for Yesterday by Ogden Nash". Baseball-almanac.com. Retrieved September 11, 2012. ↑ "1910: The Strangest Batting Race". Mlb.com. Major League Baseball Advanced Media. Retrieved September 16, 2012. ↑ Gillette, Gary; Spatz, Lyle. "Not Chiseled in Stone: Baseball's Enduring Era and the SABR Era". Retrieved September 16, 2012. Wikimedia Commons has media related to Nap Lajoie.